J.D. Griggs is a 6'5'', 270 lb defensive lineman from Akron University (OH). 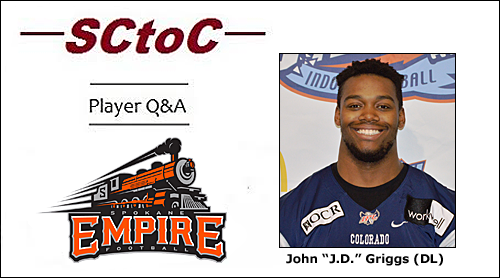 The 26-year-old Griggs signed with the Empire this past off season after spending the previous two seasons as a member of the Colorado Ice/Crush organization. In 2015, his first season with the (formely known) Ice, Griggs recorded 46 total tackles, 1.5 sacks, 3.5 tackles for loss, 1 forced fumble, and 1 fumble recovery. In 2016, he recorded 19 total tackles, 8 tackles for loss, and 3.5 sacks. He also spent time with the NFL's Jacksonville Jaguars and the CFL's Winnipeg Blue Bombers in 2013. In his first season with the Empire, Griggs has been a tremendous addition to a defensive unit that has given up an average of 35.9 points per game, the second lowest in the IFL. Through 9 games at the time of this writing, he leads both the IFL and the Empire in sacks with 7.5, and has recorded 28 total tackles (17 solo), 10.5 tackles for loss, 2 forced fumbles, a fumble recovery and a pass breakup. 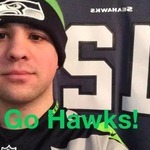 Although he hasn't used his Twitter account since 2013, you can still follow him at JD_99bomber. 2. What was it that drew you to Spokane and to earn a roster spot with this team? How much winning means to the EMPIRE. 3. What's your impression of the Spokane Empire organization and the Ninth Man compared to other places you've played? There is no comparison. The organization and the 9th Man are very professional. 4. What impact do you hope to make with the Empire this season? 5. What personal or team goals do you wish to accomplish this season? Break the sack record. Win United Bowl. 6. What is your biggest long-term goal for your professional football career? Play for 4 seasons in the NFL. 7. Who has inspired you the most in your football career and in life? 8. How do you like to spend your free time? Drawing and listening to music. 9. What would you like Empire and IFL fans to know about you that they might not know? I have 2 beautiful daughters. I love his enthusiasm for the Empire. It is reflected on his play on the field.